Lamar Odom has reportedly left a California rehabilitation facility, just one day after reportedly checking himself in following an arrest on suspicion of driving under the influence of "alcohol and/or drugs." People.com reported Wednesday evening that Odom, 33, had entered a rehab center, citing a source who said the unrestricted free agent "realized he needs help." TMZ issued a conflicting report Thursday morning, claiming that while Odom had "gone off the radar" for several days, he had not checked himself into such a facility. The Los Angeles Times seconded that, reporting that while Odom is receiving treatment for issues related to his recent arrest and has retained attorney Robert Shapiro — "a longtime family friend of Odom's wife, Khloe Kardashian Odom [who] has regularly represented clients seeking treatment for drug addiction" — the 14-year NBA veteran "has not entered a rehabilitation facility." People, Hollywood Life and E! News followed those reports with stories citing multiple sources saying Odom checked into a center on Wednesday morning and left Thursday afternoon. Whatever the order of operations, all sides seem to agree that Odom is not now in a rehab facility. Given what we know, and what we think we know, about how things have unfolded for him of late, this seems unsettling. Odom was arrested just before 4 a.m. PT on Aug. 30 on suspicion of DUI, with California Highway Patrol officials saying he was observed driving a white Mercedes SUV in a "serpentine manner," and that he showed "objective signs of intoxication and was unable to perform field sobriety tests as explained and demonstrated." He was later released on $15,000 bail and had his driver's license suspended for one year for refusing a chemical test at the time of his booking. The DUI arrest followed multiple reports that Odom — who played last season for the Los Angeles Clippers, and who won two NBA titles and the NBA's 2011 Sixth Man of the Year Award with the Los Angeles Lakers — has used crack cocaine, OxyContin and Ambien in recent years, and had gone missing for three days after a reported attempt at an intervention by his wife didn't take. Odom's agent, Jeff Schwartz, refuted those reports, saying that Odom's wife knew "exactly" where he was and that playing in the NBA for the 2013-14 season was "still very much a part of Lamar's plans." 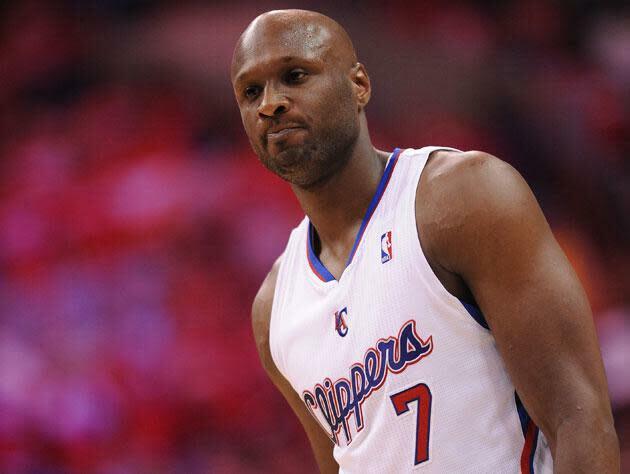 ESPN subsequently reported that Odom had holed up in an L.A. hotel, where several friends were trying to help him deal with "an unspecified drug problem." TMZ reported last month that Odom had "reluctantly agreed to go to rehab in San Diego a year ago ... although he bailed after [three] weeks."